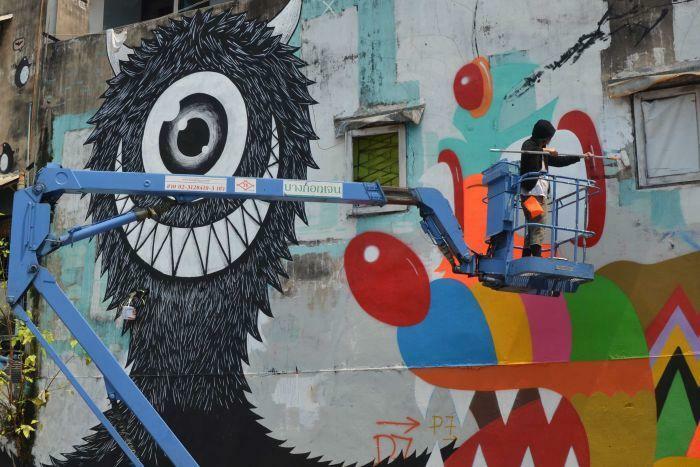 Thai and European artists have converged in Bangkok for the city's first major graffiti and street art event. Graffiti artists from across Europe are joining Thai artists in Bangkok for the city's first ever street art festival. Alex Face, who is one of almost 30 street artists taking part in the month-long festival, says the Thai capital can be welcoming place for street art. "A lot of empty spot in Bangkok - like abandoned building, empty wall, dirty wall a lot. That I think is a good spot to paint," he said. "It's more fun to paint on the wall, they got the story about that area. Like painting the canal, what happened here in the canal? Dark water in Bangkok...we can talk about that." A street artist for 10 years, Mr Face says there is "more freedom" in painting on the street because "people can see your work." The prestigious Bangkok Arts and Cultural Centre has given over 400 square metres of exhibition space over to street artists - the biggest exhibit of its kind. The festival also includes the creation of large murals around the city centre by Thai and European street artists. Local artist Yuree Kensaku is painting an enormous fly in fluorescent bright colours on one of the city's walls. She says the image is inspired by the Bukruk festival. "The name of this festival is called Bukruk which kind of means invasion," she said. "(I) chose to draw a fly because it's something that comes to bother you in the city. We're in a very humid climate. This is where it would come and bug you - it's a natural habitat for flies in humid Bangkok." The real aim was to do something colourful - something positive, if it's the good word. We hope that the people will look at it with a smile. That to us, is the most important. At a busy intersection in an area called Rama 6, French artists Amandine Urruty and Nicolas Barrone are painting a large and surreal scene. Their artwork consists of a dog wearing a burlesque mask eating a sort of lollipop, while another creature alongside it is still taking shape. "We wanted to put two big characters - one is Amandine's, one mine - and then a bit of landscape around it with some details like the rainbow and everything," Mr Barrone said. "But the real aim was to do something colourful - something positive, if it's the good word. We hope that the people will look at it with a smile. That to us, is the most important." One of the Bukruk festival's organisers is Nicolas Dali, a French designer based in Bangkok. He says he hopes the large-scale collaboration of Thai and international artists will raise the profile of street art in the city. "Actually you can't see much street art," he said. "The space where you can see street art here is nearby the highway or Ratchambui way where people go to do it. But it's still super underground, it's not really part of the city life. "So that's why we wanted to change - painting on this kind of building properly and doing something neat to show people that it could be something great - not some kind of vandal thing." The Bukruk festival runs from February 16 to March 17. Artist from Spain, Ibie, painting at Klong gallery as a passerby on a motorbike watches. A passerby walked past a painting by Raul Oprea Sebastian, or better known as Saddo, from Romania, at Siam Square. For a minute I thought the topic was a ' street tart ' festival. Bit disappointed when I took a closer look. Very cool! Young, fresh imaginations at work. I am going to follow this with interest. I like it, good stuff. I cannot help but wonder what they all would look like had they not 'all lived in a Yellow Submarine'. Plenty of scope for International Street Artists c/w access to unlimited amounts of Yabba, Girls & Cheap Booze!